Hello, everyone, and welcome to what will hopefully prosper into a great journey, the North American Markball League. I've done things like this before, but having little success due to my inability to create a logo. This time, I'm feel confident enough to make it through this. So what exactly is Markball? It's a sport based off of Aussie Rules Football, with some differences. Markball is a full contact sport played on a rectangular field with round ends by teams of 15 people. The goal like it is in most sports, to score more points than the other team. To score, a player must kick or hit an oval ball (which is around the size of a Size 1 soccer ball) into a closed net which is 9 meters tall by 5 meters wide. Goals are worth 4 points. There are two posts flanking the goal where if the ball goes between one of them and a goal post, the player has scored a point, which is worth one point. Field Size: Fields come in various sizes, but the average lengths of the field are 153 meters long and 100 meters wide, so players need lots of stamina to play. Play: Play begins when one player from each team take part in a jump-ball. Players then can run up to 10 meters with the ball, then either pass the ball or bounce it every 3 steps. If the ball goes out of bounds on the sides, play resumes with a kick-in, if it goes out of bounds on the ends, then similar to soccer, either a goal or corner kick is taken. If a player is fouled outside the arc, then a free kick is awarded. A player cannot score from a free kick. If a player is fouled inside the arc, then a penalty kick is awarded and a player can try and score. Players can pass by either punting the ball to a teammate or by hitting it with an open hand. There are goalkeepers in Markball, as opposed to none in Aussie Rules. Graham Urquhart was a Scottish-born, Australian raised businessman who had a love for sport. He played newly-created Aussie Rules football, rugby, and cricket in his spare time. Graham also loved creating ideas for new sports, but nobody seemed to be interested. But then, one day, he came up with an ambitious idea. His idea was that he could create a sport similar to Aussie rules, then go to North America and introduce the sport to them, and create a new pastime. Unfortunately for him. Nobody took him seriously so he found himself all alone. He took a big gamble and continued anyway. After a long, miserable boat ride to London, then another to New York City, he finally found himself where he planned. Wanting to show his new sport off in a smaller city, Graham traveled to Washington D.C, where he offered sessions for the men there to learn this sport. It turned out to be a great success, and in 1879, the world's first ever markball team was created. The game would spread throughout the years, and eventually, in the 1920's, there were regional leagues across both the USA and Canada. 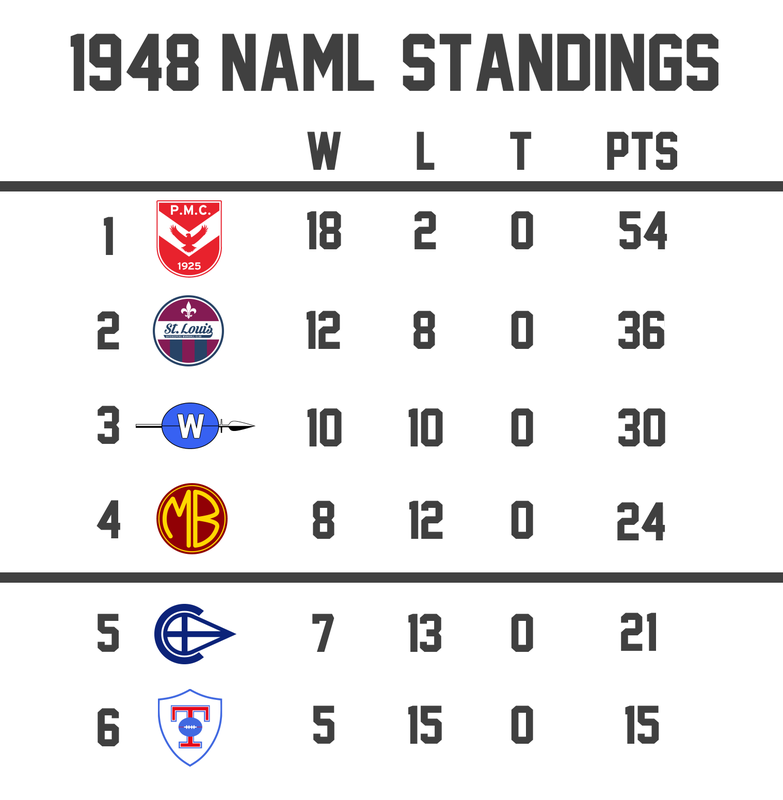 1946, on the 20th anniversary of Graham's death, his son Patrick announced that the following year, the top 6 teams from the Central and East Coast Leagues would form the first major markball league, the North American Markball League, or NAML. The League's logo was unveiled the following month. The logo consists of the league's acronym inside a shield, with four lines at the top symbolising the four posts of the net. Good start. Excited to see how this goes! Thanks for the interest guys! Posting will be slow over the next few days since I have exams, but I'll be on track after that. Some more technical stuff: Games have 4 quarters of 21 minutes, making a game 84 minutes long. In terms of positioning, there are four main positions; Forward, Follower (Midfielder), Defense, and Goalkeeper. On the field, teams have 5 forwards, 4 followers, 5 defensemen, and 1 goalkeeper. 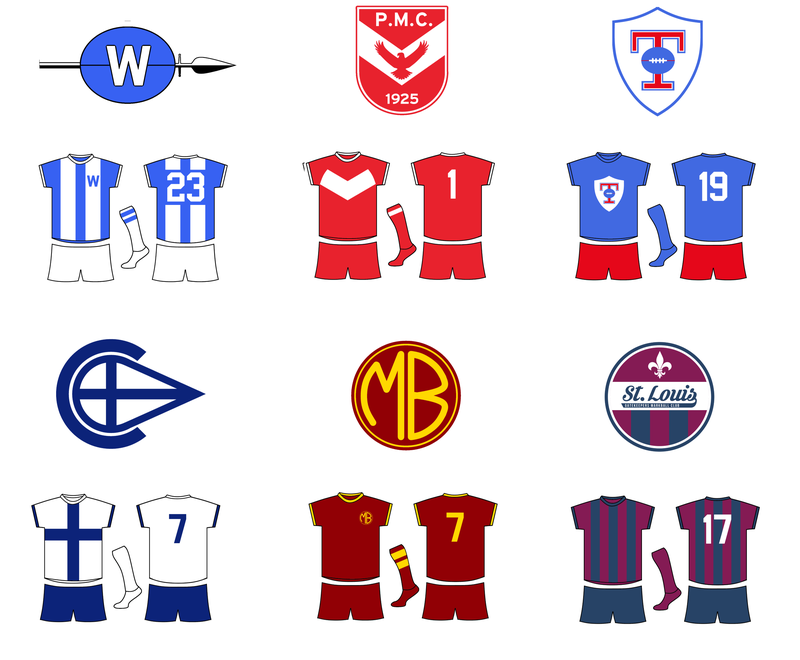 Here are the teams and their uniforms! The Warriors were the first formal Markball team to be founded, being created by Graham Urquhart in 1879. The Warriors have been a powerhouse in the Eastern League, having won the championship in 21 of the league's 27 seasons, and are expected to take home the first ever Urquhart Cup this season, being led by star forward Leo Edward. The Logo is a W in a silhouette of a ball with a spear behind it. The uniform features two stripes on the front and back, with a W near the player's heart. The Falcons were created in 1925 by a group of businessmen who had great passion for the game. They named the team after a falcon one of the men noticed was perched outside the window of the house they were meeting in. 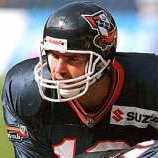 The Falcons are one of the few teams besides Washington that have won a title in the EML, with 4. The team's jersey is red with a white chevron. The logo is a shield with a chevron, the club's initials, and the year it was founded. The Nationals, the second professional Canadian Markball team, were originally based in Brampton, but moved after filing for bankruptcy. The Nationals have been controversial at times, having numeral on and off-field brawls throughout their history, and multiple scandals. However, the team's new owner, Felix Cross, has promised to put all those events in the past and write a new chapter in the team's history, introducing a new logo for the NAML. The logo is a T in a shield with a ball over it, and their jersey is blue, prominently featuring the crest. The Crusader were the second markball team to be created, after Granville Rayne, a man visiting Washington, became interested in the sport and brought it back to his hometown of Chicago. Rayne was a devout Christian, so he named his team the Crusaders. They have been the most successful team in the Central League, with 4 titles. The Crusaders' Logo is a C with a stylized Crusade flag inside it. The jersey features a bold blue cross on a white background. The Bandits are loved passionately by their fans, and despised by everyone else. Formed by a rebel group who were unhappy with Detroit's first club, they created their own and paid players to join their team, ultimately leading to its demise. This drew a lot of hate from other supporters, but there was little they could do. The Bandits became a strong team who won 3 successive titles after this controversy, and are looking to be a dark horse in the race for the Urquhart Cup. The Bandit's logo pays homage to Detroit's auto industry, with a stylized M and B in a roundel, similar to a car company's badge. Their uniform issimple, a burgundy base with gold accents. The Gatekeepers have always been a good team, but have never finished higher than 2nd in the CML standings. Whenever they do good, another team does even better and grabs all the attention. That happened again this season. Despite dominating in the games they've won, they can't seem to win when it matters most. The Gatekeepers have made it to two championships, but have lost both in heartbreaking fashion. The team's logo is a roundel with the team name in the middle, a fleur-de-lis at the top, and maroon and blue stripes at the bottom. The jersey consists of alternating maroon and blue stripes with white numbers. Any C&C about the logos and uniforms is appreciated, as I haven't been too confident in my logo-making skills as of late. The first season should be up later this week. Thanks for reading! The Crusaders are easily my favorite logo and look of the whole bunch. I'm curious to see what you'll do when hopefully Boston enters the league. So, I'm trying a different format that normal for posting seasons, any feedback on how it's posted is appreciated, so I know if I should continue like this. The Warriors were the heavy favourites heading into the season, being led by star forward Leo Edward. Washington started off the season on a roll, not losing until week 12. Edward was a huge part of that, setting up many of his team's goals and making great plays out of nothing. The Warriors' fortunes unfortunately took a turn after defenseman Peter Sneel suffered a bruised chest after an awkward tackle. They couldn't seem to get back on track, but because of the hot start, they finished with a great record of 14-4-2. The Falcons were the big surprise of the season, winning most of their games, and by a fair margin. First year Player-coach Grad Rox was the mastermind behind their success, with his tight-checking midfield causing lots of problems to the opposition. Rox also had a solid season statistically, leading the league in tackles. The Falcons finished the year in first place, with a record of 16-3-1. The Nationals' new look approach definitely worked in their favour, as the amount of fouls taken by the team greatly decreased from the previous year in the Eastern League. Instead, they used their loaded offense to win games, led by virtually uncontainable full forward Lester Gros, who led the league with 59 goals. The Nationals also drew much larger crowds than in previous years, giving them record profits. The Nationals finished with a record of 11-9-0. The Bandits were not expected to do too much during the season, but after narrowly defeating the Falcons and tying with the Warriors, They were determined to show that the critics were wrong. Captain Len Garey had a solid season, and Goalkeeper Andrew McCaig made key saves, leading the Bandits to a surprising 4th place finish, with a record of 9-10-1. The Gatekeepers were expected to finish at the bottom of the league, and after a large loss against Toronto to start the season, they were destined for that spot. Their players simply weren't as skilled or experienced as those on the other teams. The only bright spot for their season was the signing of Arnold Lejoscasa, a local teenager that the media touted to be a future star. The Gatekeepers finished with a lousy record of 3-16-1. Washington follower James Doctor suffered a dislocated shoulder after making a spectacular diving catch in a game against Toronto. Michigan captain Len Garey scored 3 goals in the final quarter to complete a 29-point comeback over St Louis. The Final score was 44-42. Toronto forward Lester Gros scored an unfathomable 11 goals in a 59-34 win over Chicago. The Falcons won all three meeting against the Bandits this year, but two of them were by a couple of points. Expect the Bandits to put up a big fight, but for the Falcons to prevail. Philadelphia follower Grad Rox should have a big game. The Nationals won 2 of the three meeting between these two teams this year, but the Warriors are hungry for a win, after losing their last game against the Bandits. Expect this one to be close, and maybe even be decided in a replay. Another big game is expected from Lester Gros of the Nationals, as well as from Leo Edward of the Warriors. The Semifinals will be up soon, Thanks for reading! Why are draws worth 2 points in the standings while wins are only worth 3 (normally a draw is worth half as much as a win at most in terms of points)? In terms of the story, Graham Urquhart valued draws much higher than other people, and decided that they should be worth an extra point. In terms of real life, I just thought it would be interesting to see what effects this would have on the standings. The Falcons started the inaugural NAML semifinals with a high flying offence, but multiple key saves by Bandits keeper Andrew McCaig kept the Bandits in the game, and they surprisingly held a 1-point lead after 1 quarter. After a converted penalty shot by Philadelphia forward Cecil Bonnom, the Falcons hit their stride, scoring 13 in the quarter to give them a 21-17 halftime lead. The Bandits couldn't get the ball downfield, and the Falcons used this to their advantage, and they never looked back, holding an 11-point lead after three and eventually winning 43-30. The Nationals started their matchup off right when Lester Gros scored a mere 26 seconds into the game. Washington responded with 3 quick goals, but Toronto got one back, making the score 12-8 with half the quarter to go. Both teams struggled with accuracy for the rest of the quarter, and Washington held a four-point lead after 1. The second quarter was even worse, with both teams scoring a combined 5 points, and no goals. The Warrior attack woke up in the third, putting the game out of reach after 3. Despite a furious 4th quarter by the Nationals, the Warriors held on to win, 47-39. Washington @ Philadelphia, at Washington D.C. The season series between these two teams was split two games apiece, so while it should seem that it will be a close game, the Falcons are hungry for a cup win against their closest geographical rivals. Cecil Bonnom had a great game in the semifinal, and should continue his form in this game. Prediction: Philadelphia will hoist the first Urquhart Cup with a 43-24 victory over the Warriors. Location: Presidents Park, Washington, D.C. 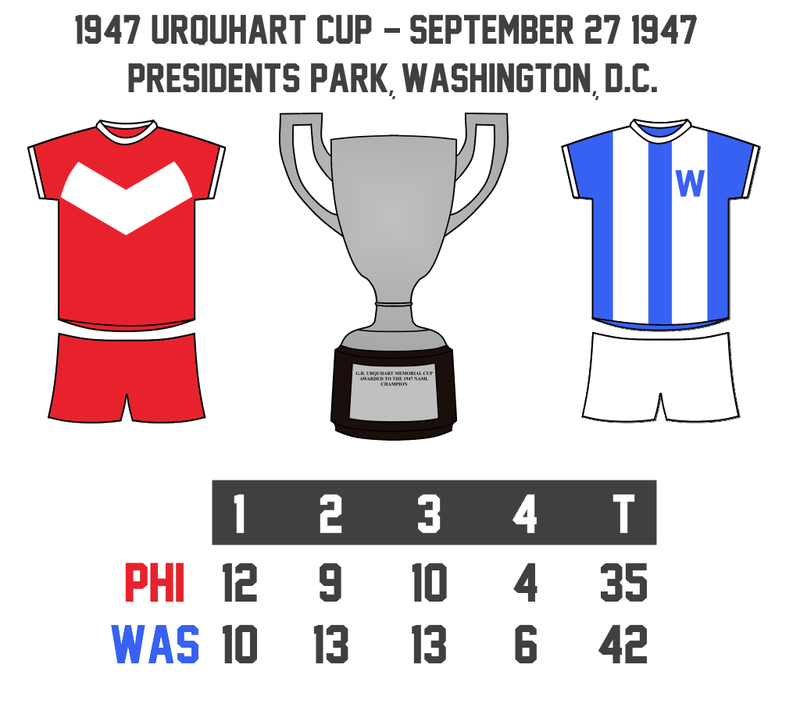 The Inaugural Urquhart Cup Final was contested between two geographical rivals, the top seed Philadelphia Falcons and the host Washington Warriors. Over 50,000 people flocked to Presidents Park to see their heroes contest the match. The hosts got off to a great start, getting a 5-0 lead before the Falcons could get into the game. Falcons wing forward Richard Zorbeck would score a long goal to get a Falcons on the board, but seconds later, Leo Edward scored his first to make the game 9-4. The Falcons would dominate the rest of the quarter as they did during the regular season, getting a 12-10 led after one quarter. Washington fans would start getting uneasy when Philadelphia flank Harold Grensepher easily walked past Warrior defenders to score a goal and bring the score to 16-10. After play remused, Edward almost became a different player, running faster and tackling harder than he had ever done before. To the fans' delight, He scored 3 consecutive goals and added 1 point to bring the score to 23-16. Cecil Bonnom would score for the Falcons and Grad Rox added a point to bring the Falcons to within 2 at the half. Early in the third quarter, Rox was in all alone and appeared to give the Falcons the lead when Washington keeper Gerald Chance dove back, scooping the ball out of the air and into the hands of a defender. Nobody could believe what they saw, and Washington supporters gave Chance a prolonged standing ovation after. The two teams would trade goals, then follower Billy Cowden would score on a breakaway for the Warriors, bringing the score to 32-25. The Falcons started pressuring towards the end of the quarter, but Chance stood tall, only allowing one other shot past him in the quarter. the Score was 36-31 for the Warriors after 3. The fourth quarter was slower and more defensive than the others. Chance turned four potential goals for the Falcons into four points. Roger Causson scored for the Warriors, putting it away. The fans had to be restrained from entering the field in the dying minutes of the game, but once the referee gave the final whistle, the fans stormed onto the field to celebrate with their hometown heroes. When asked about his sensational save, Chance said "I was determined to save it, whether I died in the process or not. I was not letting that ball cross the line." Leo Edward was awarded the inaugural Urquhart Cup MVP award. After receiving the award, he told the press "It's an honour being the first recipient of this award, But with that being said, my team played excellent tonight. Every single person is equally deserving of this." Meanwhile, the Falcons were getting this match out of their head right away. Grad Rox was determined that next year would be the Falcons year. "It's unfortunate that we lost this game, but we'll come back strong next year." He said. After upsetting the Falcons in the Urquhart Cup, the warriors were expected to fight Philadelphia again for the top spot in the table. However, that wasn't the case. Leo Edward had another great season, but the rest of his team couldn't find their form, losing many close games decided in the final minute. 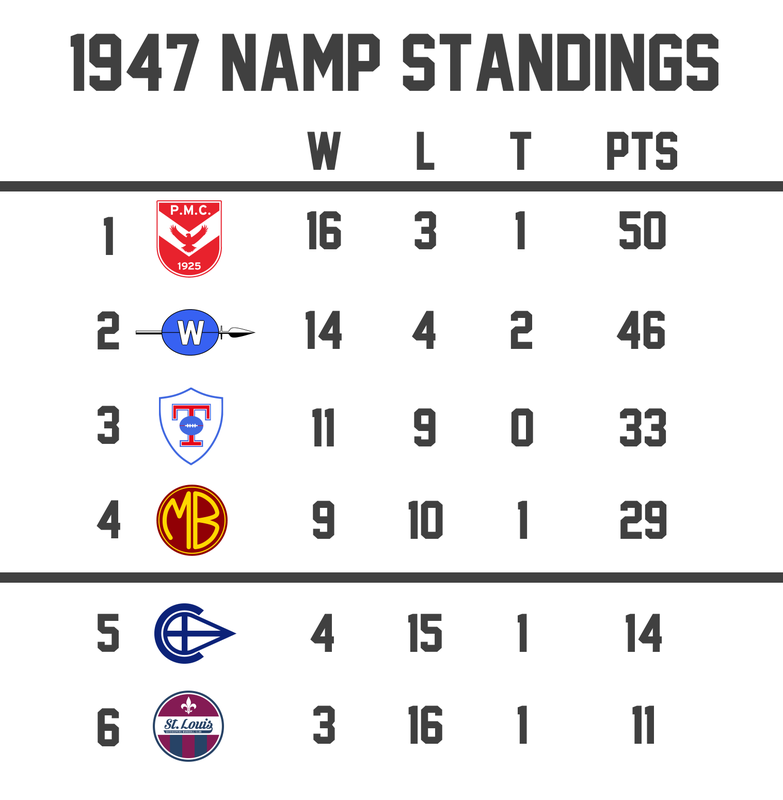 But the pace picked up at the end, and the Warriors managed to break even, finishing third in the NAML with a record of 10-10. It seemed like Grad Rox was correct saying that this year would be the Falcons' year, as they won their first four games by wide margins. After a poor performance against Toronto, the falcons rebounded with 7 more easy victories. Cecil Bonnom was a key part of that streak, kicking 25 goals. After losing to the Gatekeepers, Philly ended the season on a tear, winning the final 8 games. Rox had a quieter season compared to the year before, but still put up solid numbers. The Falcons finished the season 18-2. The Nationals were dealt a devastating blow when Lester Gros severely injured his hand in a car crash. He would successfully recover after 4 months, but by that time, Toronto had dug a huge hole that was almost impossible to get out of, with a record of 3-14. with Gros back, Toronto would get back-to-back victories, but it was no use, The playoff picture was already set. The Nationals finished at the bottom of the league, with a record of 5-15. After a disappointing season before, the Crusaders had their hopes high. They would start off the year with a 20 point loss to St. Louis, and would start the season 2-3. Chicago was a mediocre team for most of the year, but the last three weeks, they collapsed, losing control of the last playoff spot. However, the future was looking bright, with forward Herb Bradley leading the league in scoring, with 49 goals. Young goalkeeper Sid Belmont was also showing signs of improvement after a terrible season before. The Crusaders finished the year 7-13. The Bandits were looking to get back into the playoffs after losing to the Falcons in the semifinals. Many oddmakers picked the Bandits as a dark horse, but also saying that they could just as easily miss the playoffs. Captain Len Garey had a solid season in the midfield, becoming known around the league as "Tank" due to his explosive force in his tackles. Goalkeeper Andrew McCaig made key saves, and defenseman Harry Keener became respected around the league. The Bandits started the season strong, but fell off near the end, just holding on to the last playoff spot at the end of the season. Michigan finished 8-12. The Gatekeepers were the biggest surprise of the season, being led by rookie sensation Arnold Lejoscasa, who didn't seem phased at all by the transition from amateur to pro. Lejoscasa put up above-average numbers consistenly over the entire season. His arrival seemed to spark the rest of the team, especially forward Ben Acton, who finished 3rd in league scoring. Despite not having a win streak longer than 4 games, St. Louis finished 2nd in the league with a record of 12-8. A Game between Washington and St. Louis was delayed by an hour after officials printed the wrong start time of the game, making the players arrive 15 minutes after the scheduled opening jump-ball. Toronto forward Willie Jones was honored by the club for playing his 300th professional game, becoming the first player to accomplish this feat. Washington fans had to be restrained by police after trying to get at the umpire after a bad call. Crazy wind conditions at a game between Chicago and Michigan led to the loss of all of the provided match balls. However, as the game was almost over, Officials decided to end the game. Once again, Philadelphia won all three meetings between these teams, but two were decided by two points or less, showing that the Bandits could be capable of pulling off a huge upset. Falcons forward Cecil Bonnom should continue his form, as well as Bandits follower Len Garey. Prediction: Philadelphia will head back to the final with a 36-29 victory. With the exception of the second game, these two teams looked even during their meetings, meaning this one should be as well. St. Louis rookie Arnold Lajoscasa should have a quieter game, and Leo Edward will almost certainly play his heart out. Prediction: There will be an Urquhart Cup rematch as Washington wins a close one, 33-29. Any thoughts on the league, the sport, or feedback the way I post are appreciated, Since this is my first time doing a project like this. After the playoffs, The league will look for Expansion teams, so look out for that! Very few people gave the Bandits a chance ahead of the game, and some fans had already started making preparations for the Urquhart Cup Final in Chicago. Amidst all the critics, The Bandits headed into the game fairly confident, even though the Falcons team they were facing was hungry for another final appearance. The game started off quick, with Grad Rox and Cecil Bonnom scoring two quick goals, much to the delight of the home fans. Len Garey made some good plays for the Bandits, who put on the pressure and they found themselves down only by 3 points after one quarter. The second quarter belonged to the Bandits and goalkeeper Andrew McCaig, who wouldn't let the Falcons get anything going. Defenseman John Bird had a great quarter for Michigan, starting a rush that would lead to a key goal for the Bandits, and they would end up ahead 25-18 at the half. The Bandits continued their strength in the third, and had built and unbelievable 15-point lead over the Falcons. However, Rox and Bonnom led a late charge for Philly, and they would cut the deficit to 6 heading into the fourth. However, Whenever a Falcons player scored a key goal or point, Michigan would respond seemingly right away. Late in the quarter, frustrated fans started exiting the stadium. When the final whistle sounded, everyone on the field dropped to the ground in disbelief. The Bandits pulled off the greatest upset in current markball history and were headed to the Urquhart Cup Final. Even though the Gatekeepers were the better team on paper, Washington was more experienced by far, nobody on St. Louis' roster had played a playoff game. All eyes were on 'Keepers rookie Arnold Lejoscasa, who could either embrace the spotlight and play well, or shrivel up and let Washington take over. The game started off well for St. Louis, as Lejoscasa's cross was deflected in by Al Sokker, giving them a 4-1 lead. But then, they just collapsed. Leo Edward was stellar in the quarter scoring and making plays, giving the Warriors a huge 18-4 lead after one. Sokker helped the Gatekeepers rebound in the second, cutting the lead to eight points at the half. But the third quarter may have been the most one-sided in markball history. Nothing went right for St. Louis, and five different players scored for Washington, who scored 21 points in the quarter and gave up none, making the score 44-15 after three. the fourth quarter was a lot more even, and Lejoscasa scored twice, but it wasn't even close to being enough as Washington would win 54-25. Halfway through the season, commissioner Patrick Urquhart awarded the Urquhart Cup game to Chicago. The game will be played at Columbus Stadium. These two teams played two very close games during the season, so the game could be close. The Warriors also have experience in the final, winning the previous year, so the game could be an easy victory for Washington as well, but don't count the Bandits out. Andrew McCaig has been solid in net, so Leo Edward may have a quieter night than normal. Expect a breakthrough game from Bandits captain Len Garey, whether win or loss, Garey always plays with passion, which could be taken to new heights. Prediction: The Underdog will win again: Michigan will lift the cup with a 33-23 victory. 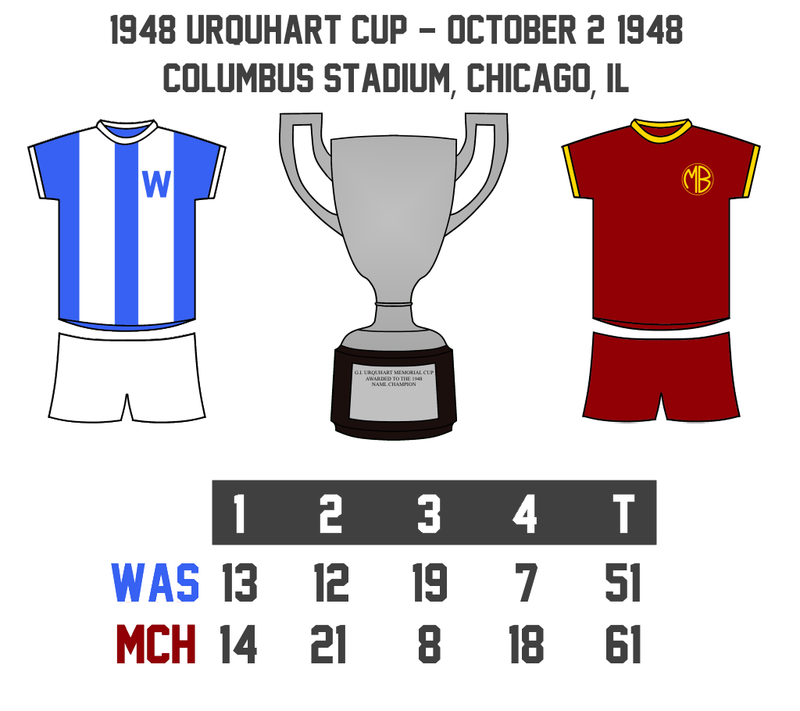 Even though the Crusaders had limited success during the season, Many Chicago fans packed Columbus Stadium, along with travelling fans from Washington and Detroit to see the 2nd Urquhart Cup, between the two lower seed teams, the Warriors and the Bandits. Many people expected the game to be close and low-scoring, with both teams boasting star goalkeepers. But the opposite happened. Washington scored the first point, but Ruben Gagne and Stanley Keyne both scored for Michigan to give them a 7-point lead. Washington would claw back, with relatively unknown forward Lawrence Sanderson scoring 3 in the quarter. Gagne scored again for the Bandits, who led after 1, 14-13. The second quarter started with Leo Edward scoring two quick goals for the Warriors. Breakout defenseman Harry Keener responded with a long-range goal. Then came Len Garey, who, similar to Leo Edward in the previous grand final, became a different player, scoring 3 consecutive goals in the quarter and adding another one later. Michigan keeper Andrew McCaig had a great quarter, stopping several attempts on net. his counterpart Ambrose Gares seemingly couldn't catch a break for the warriors, giving up 5 goals in the quarter. Michigan expanded their lead to 35-25 after two. At the half, the fans realized that the game was going to be a lot more high-scoring than expected, and were excited to see what the second half would hold. Washington would start strong, with Edward getting his third goal, and his team adding two points to cut the deficit to 4. But Michigan would respond. with follower Brice Smith potting one, and Keyne adding another. Sanderson, who undoubtedly was having his best game of his career, helped the Warriors get back in the game by adding two goals, and follower James Doctor gave Washington the lead just before the whistle. The Warriors were up by 1 and one quarter away from winning the first two Urquhart Cups. But Michigan was determined to pull of another upset. Edwin Tasker got the lead back for Michigan, and Len Garey continued his fantastic form by scoring his fifth. Washington got a couple of points, but Tasker scored two more to put the game out of reach. James Doctor would score a consolation goal for Washington. Michigan controlled the ball of the jump, and the referee blew the final whistle. The Michigan Bandits had gone from a playoff afterthought to the winners of the second Urquhart Cup. The MVP Award was given to Bandits Captain Len Garey, who had a game for the ages, being solid defensively and scoring a career-high 5 goals. After receiving the honour he said "We just wanted to prove everyone wrong. You can never count a team out, even if they appear to have no chance. I'm extremely proud every single one of our guys." Meanwhile, Leo Edward was visibly distraught after the game, saying through tears "We let it slip away. We were doing so well but we couldn't keep it up." After the game, commisioner Thomas Urquhart had some great news for the league. "We are looking for two new teams to join this wonderful league. We will be adding one existing team from either the Eastern or Central league, and awarding expansion to one lucky city We will have more details on this exciting moment later"
Next up I will be posting potential expansion teams and cities, and if enough people are interested, I will hold expansion council similar to other leagues on the boards. Okay, here are the rules for the expansion. Since it doesn't look like many people are gonna participate, Your choices will most likely be the new teams. Here are the things I would like you to put down when voting. Name: Any name really works, just make it a full name. Personal Biography: Put some background about your person. Profession, Age, Hometown, Something about why your person likes Markball, etc. 1 Current Team Vote: Pick a current team from the list that you would like to see in the NAML. Please also say why you picked that city. 1 Expansion City Vote: Pick a city from the list for a new team to be created in. Once again, Please say why you picked that city. Name(s) for the Expansion team (optional): Any suggestions for the name of the expansion team would be appreciated for the sake of creativity. This might be a little strict, but if your vote doesn't meet these terms, it won't be considered. Writing this in sentence format would be recommended as well. Thanks to all who participate! The list of teams and cities will be up shortly! So these are the current teams you can pick from, remember that you can only pick one from these. Now for the Expansion Cities! Boston Mayor James M. Curley is an avid Markball fan, so he ordered the creation of a new extraordinary state-of-the-art stadium to try and land a team in his city. The stadium will revolutionize the viewing experience for specatators, and has been dubbed by many as the 'Most incredible stadium in the world'. Commisioner Thomas Urquhart has been vocal on wanting to expand southeast, and his first choice in that area is Charlotte, who have the stadium ready for a team, but the fan interest hasn't been ideal. Urquhart still insists that the fans will change their mind, as they will have their first professional major-league sports team. Even though Dallas has never had a professional Markball team, it is still the most popular sport in the city, and they have shown that they are more than ready to host a team, with a first-class stadium, and tremendous fan support. Commisioner Urquhart has stated that if Dallas is not awarded a franchise, they will receive a team in the Central league. Urquhart also promised that one or two Canadian cities would be considered for expansion, and after reviewing interested cities, Ottawa was chosen as the best candidate. Even though the Stadium is old and starting to fall apart, Mayor E.A. Bourque promised that the Stadium would receive significant renovations if they were awarded the team. The public is also very inviting to receive a team, whether it's the NAML or the EML. After reviewing Canadian candidates, Quebec City was also seen as more than ready to host a team. Although Stade St-Joseph has low capacity, It is among the best in Canada. Fan support is also high, though some are cautious about being the only French team in the league. Others think that will motivate the team to play better. So these are the teams and cities, and I hereby declare the Expansion council to be open! W. Harris Reynolds, 40, is a shipping tycoon whose business is based on Long Island. Having come across the sport on his business excursions, he immediately fell in love with the sport due to its quirky concept. He also took pride in the fact he was one of the first prominent supporters of the sport and its sanctioning body. In regards to the expansion council, his current team vote goes to New York, since he is surprised that the NAML still doesn't have a team in the largest city in North America. For the expansion city bid, he decided to go with Quebec City, a wild card to be sure, but he feels another team in Canada, especially one in the French-speaking province, would help establish the sport there. Current Team: New York Knights, New York is not only MacDonald’s adopted home but he thinks it makes the most business sense with 6.62mil expected followers by far the biggest.